Blue Swami Media offers finest Online Reputation Management solutions to various firms. For a successful business, building affirmative image is quite concise and important. ORM is a process of controlling your image and brand value on major search engines like Google. Webmasters control the individual’s and business’s reputation in order to achieve professional goals. Our firm organizes special and customized campaigns of ORM. This practice is ideal for the websites having low quality and categorized under the penalize sites by Google. 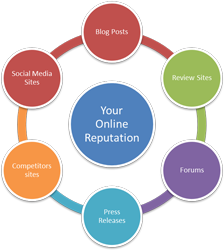 Online reputation management helps in improving the image, brand value and overall appeal of the site. Moreover, it also helps in gaining good positions in leading search engine results pages or SERPs. This is a powerful tool in increasing traffic and revenue too. We at, BSM provides complete customized reputation plan as per your business requirements. We understand that, gaining maximum sales and high return on investment requires high user visibility. Users visit the site if it has affirmative presence and attains top ranks in Google or other search engines. We execute the strategy after diagnosing your google rankings and impacts over customers. Negative feedback made by the customers can adversely affect your site and its position in SERPs. For every enterprise, it is important to maintain high quality standards and acquiring quality positions. BSM focuses on building the affirmative reputation of your business and let you achieve high online presence, increasing traffic, top ranks and high quality standards!